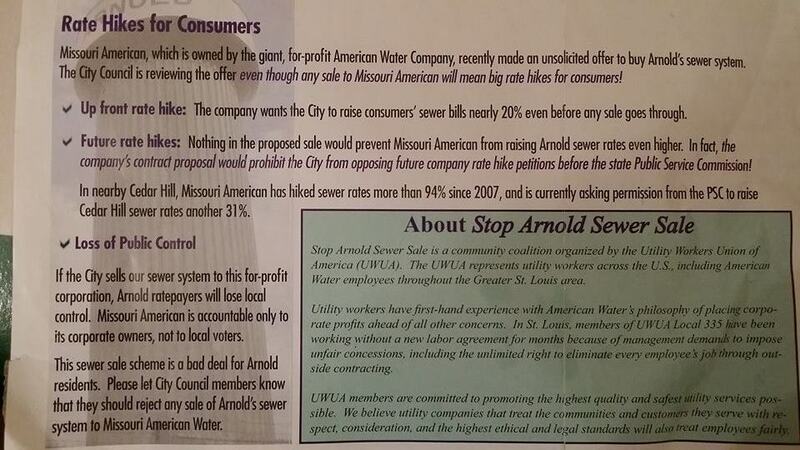 As I have previously written, the city of Arnold is asking its residents to vote on November 4 to allow the sale of the city sewer system to Missouri American Water (MAW). This same issue was considered 2.5 years ago, when MAW offered the city $12 million for the system (the city owed $11 million on sewer bonds at the time). The city council voted unanimously on 2/2/2012 to reject the offer. Current city council members that participated in that vote were Phil Amato and Paul Freese. In its unsolicited bid to expand its empire by acquiring Arnold’s wastewater system, Missouri American Water demanded the City impose a nearly 20 percent hike in ratepayers’ sewer bills before the sale was completed. In addition, the company demanded agreement from the city that they would NOT oppose any future rate hikes requests before the Missouri Public Service Commission (PSC). Although American Water approached the city with a multi-million dollar offer, after careful evaluation of [the] matter, it was clear that not enough assurances could be provided to ensure the protection of the City’s residents or the City employees who were proposed to join American Water. It [the $1 million net proceeds] was not enough money to sacrifice local control. This time around, the city will net $5.2 million in proceeds and then have access to the sewer reserve fund and its $4 million. From what I can tell from the 2012 city budget (p. 188), the sewer fund also had $4 million in it at the end of 2011, but nobody at the time seems to have mentioned adding the money to the net proceeds. We want to make sure our (sewer department) employees are well taken care of, and as far as benefits, pay, and job security, we know we could take care of them best. With the Missouri Public Service Commission approving rate increases, there’s uncertainty there. With local control (of the system), we have the ability to run it as a break-even. They would have to make money. They’re publicly traded, and have stockholders. Local 355 the point at the time that MAW had hiked the rates for the Cedar Hill sewer over 94% since 2007, and was asking for another hike. Arnold Mayor Counts said the sale looks better this time around because the city has tight finances right now and the sewer system is plagued with problems that will cost a lot to fix. [T]he sale would benefit residents, too, because Missouri American is better equipped to fix and manage the aging sewer system. Also, the company can operate the system more efficiently, which probably means lower sewer rates down the line. However, the biggest differences between now and then seem to be that the city needs the money more now – as Counts indicated – and there is about $4 million more to be had, and the council can no longer avoid raising rates. Selling the sewer system brings in the money and relieves the council of the responsibility of raising rates.